Anyone have a trick to hide classes on an individual layer within a VP? ie: window/door tags, door swings, etc. on layers visible below the working layer. See attached. Are there parts of the lower layer you still need to see in the VP @khumenny ? 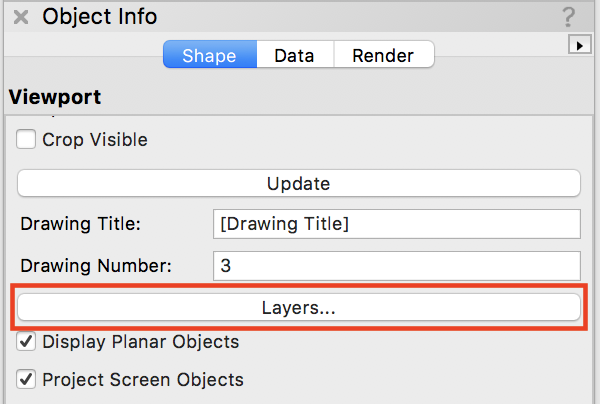 If you want the lower layer(s) turned off completely use the layers option in the VP to control visibility. If its more complicated than that and you want just a few objects 'missing' from the image you could subclass the items and have them with an added layer description. So ALL doors, but doors on layer 1 and 2 as subclasses. Bit of a pita, but you can then control doors by layer 1 , layer 2 or ALL in class visibilities. Then there's the rough and ready way! - place a white filled object (no line obviously) over the offending parts. This will then hide on printing. Works for me. I agree with Gadzooks on the first recommendation. You would have to sub class the doors on the floors to differentiate them between layers when showing the 2 floors in the same vp. I would suggest that be added to the wishlist request section. That would be a great filter to add to shut off that class for that layer only when showing more than one floor plan. Why not stack your viewports. Stack your viewports on top of each other. rgcn, agreed, this would be a good one for the wish list. TomKen... of course, why didn't I think of that? I've done it with interior elevations before. It's better if we just get the software right! Work arounds can lead to the implementation of a feature. The engineers can't predict every way someone will use Vectorworks. By asking for something like this to be changed in Vectorworks brings it to the attention of people who write the code. That is a very good point and reminder @rgcn. @khumenny Just so I know, why are you wanting to have some of the lower floor seen in that VP? 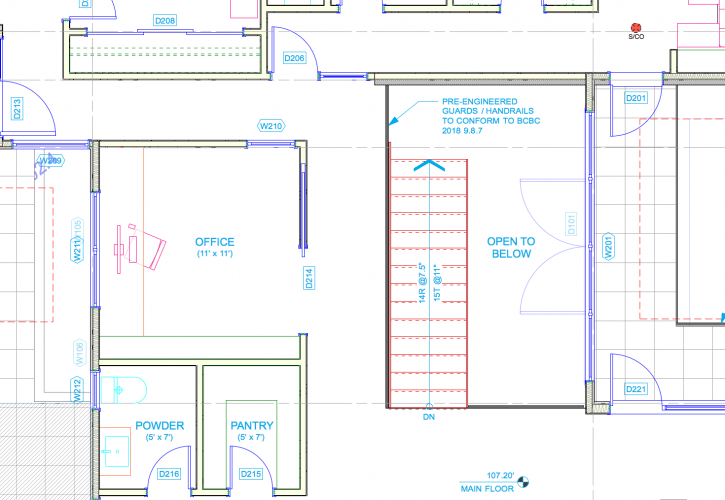 Is it to show the vertical alignment of those items (doors, windows), but in plan rather than in an (interior) elevation? In plan, the reason I like to see the floor below is to show how it relates to the working level, for example, any architecture that extends beyond the footprint of the working level, decks, roofs etc.... but as I type this I see where you're coming from as I don't separate my slabs to their own layers so perhaps I need to start doing that and I wouldn't have this problem. It's kind of creepy how you did that. I do get why you're wanting to show what you are showing. You are really thinking (and hence wanting to portray) how something will be built and how the elements relate to each other. It's a good thing as that will help the builder understand your project better prior to beginning work. As for separating slabs to their own layers, you certainly could do that and it does allow you a bit more flexibility while working and presenting. I still think @rgcn's wishlist request is a good one though... That would be a useful feature to have. One way I have tried doing this is to have the main floorplan in top/plan view as you have, and then level(s) below that viewed in hidden line as a top (not top/plan) view. This done with two viewports, cropped around each other. A bit of a fiddly workaround though. At present I am experimenting with abandoning top/plan altogether and doing the whole thing as a horizontal section...that is kind of another story though. 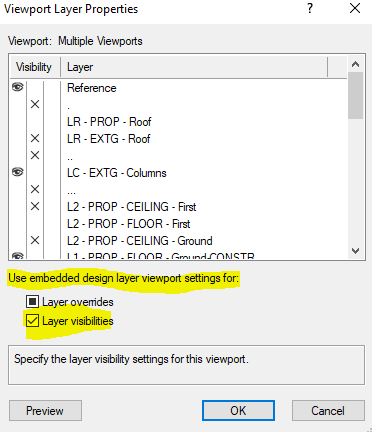 For this to work the SLVP layer visibility settings needs to have visibilities for embedded DLVP settings checked. Do you find this reliable? In the past I've had problems with odd things happening to DLVPs viewed in SLVPs, so have been a bit nervous about using this kind of setup. It's with 3d views that I've experienced that though. I get what you are doing. So the decision is stacked viewports which can sometimes be an issue one gets moved without the other, or having more Design Layer Viewports but then having the SLVP as a single object. I personally prefer to have as few Design Layer as I can in project. For top/plan views yes it is reliable. You need to have an organised file with clearly named DL's and VP's as otherwise it can get confusing if you have multiple DLVP's. For 3d work, I only use DLVP's for new builds where the siting of the bldg is still to be determined. i.e. the model is in a DLVP so it can be nudged around the site as the design progresses. I prefer to put DLVP in there own (clearly named) DL simply to keep the file clearly organised as mentioned above, however the DLVP does not need to be on it's own VP (It could be on it's own class instead). 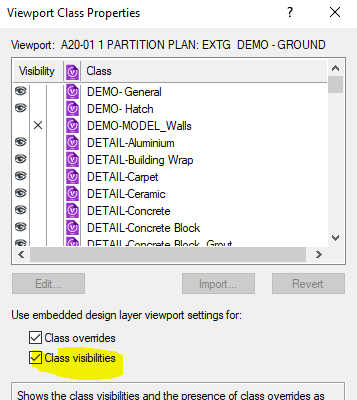 Should also have mentioned that similarly to SLVP design layer visibilities you need to use the class visibilities of the DLVP's. I used to use them a fair bit when I was still working entirely in 2d so also in top-plan. Sounds like you manage to use them in 3d. I presume that wouldn't be a sectional viewport though. I think it might be sectional DLVPs that tend to send everything haywire (I just tried again this evening and still find them to cause problems, started another thread about it). I think if you peel this onion away enough, you'll come to the brave conclusion often voiced throughout this forum, and that's the need to do away with design layers altogether. I haven't messed around with the horizontal section yet, but from what I understand, the functions represented by 1-5 are currently available? Actually, I'm not sure about #4. Can the horizontal section be viewed in Top/Plan mode at the cut plane? Am I wrong in suggesting that all of these display issues might be a bit simpler to control if we didn't have to deal with the merging of two somewhat redundant organizational/display paradigms? Yes I think that a lot of problems arise from dealing with the merging of display paradigms. My feeling is that design layers are still useful as an organisational device (it might be that stories can take their place, I don't know because I gave up on stories a while back). I think that it's top-plan that may be the redundant part. I'd be happy to see the back of top/plan, alongside section viewports (including horizontal sections) being improved and made a bit more clever/customisable. Actually that's an interesting point that the 2D symbol view thing introduced with 2019 might be seen as going in this direction. 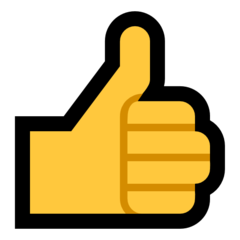 I'm still on 2018 so haven't messed around with that yet - does it allow you to set up symbol objects such that they would show as a 2d over-ride in a horizontal section as well as a vertical section? I've struggled a bit to see the point of that new feature but maybe it could be quite useful if it works in horizontal sections. I have to say that currently I find setting up display properties pretty overwhelming in VW. Right at the moment I'm trying to rationalise how I use 'material' classes so that things work in both a 3d (openGL) view, in sections including non-merged sections, and in elevation or 'beyond the cutting plane view' and its close to driving me insane. I've had to basically draw up a table to try and work out which settings where have what effects in which display modes. Settings are scattered in different locations, many have misleading names, and certain combinations work in one display mode but not another. It's a mess, really a mess. there are a lot of changes to 2019 that will most definitely make you have to start your table all over again. Foreground plan section hidden line views, adjustable plan section heights (helpful with stepped foundation walls, etc. 3D section view plans might also allow for slab textures to actually display the associated hatch pattern in plan.